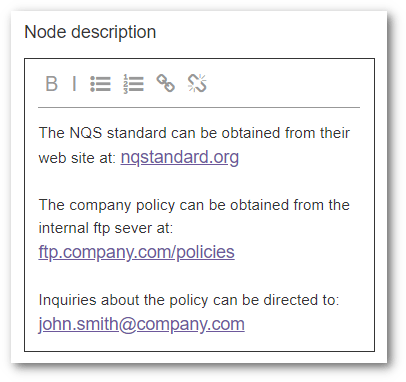 Have you ever wanted to add some ancilliary material to a node in a MEERQAT basemap, like a policy document, indicator form or data spreadsheet? Now you can with a new hyperlink option for node descriptions in MEERQAT’s basemap builder. This feature allows you to insert hyperlinks for most URI schemes including http://, https://, ftp://, or mailto:for linking to web sites, files and emails. Links to documents can not only be pointed at internal servers, but also at online file storage apps such as Dropbox, Google Drive and Microsoft OneDrive.